In April 2018 the Patriarchate of Constantinople decided to admit for consideration the issue of granting autocephaly to “the Orthodox faithful of Ukraine.” The episcopate of the canonical Ukrainian Orthodox Church unanimous spoke out for the preservation of its current status. However, against their will, Constantinople has set about implementing a project of the Ukrainian autocephaly. 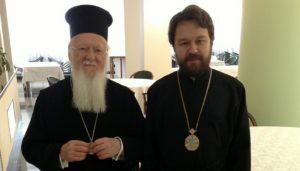 The communiqué of the Chief Secretariat of the Holy Synod of the Orthodox Church of Constantinople, published on 7 September 2018, states that two hierarchs, Archbishop Daniel of Pamphilon (USA) and Bishop Hilarion of Edmonton (Canada), were appointed “exarchs” of the Patriarchate of Constantinople in Kiev. In his interview to Russia 24 TV channel, Metropolitan Hilarion of Volokolamsk, chairman of the Department for External Church Relations, commented on the current situation and the reaction of the Moscow Patriarchate on the aforementioned decisions. – Let us clarify for our viewers once again who exarchs are and why these bishops have been appointed to Ukraine from the USA and Canada. What are they needed for? – The Greek word “exarch” means “superior.” The heads of large church areas were called “exarchs.” Besides, the word “exarch” is used in the meaning of “special envoy.” I suppose that what is meant here is that the two special representatives of the Patriarchate of Constantinople are to go to Kiev to prepare the granting of autocephaly to the Ukrainian Church. – I would like to clarify the situation. The Ukrainian Orthodox Church (and it is to prepare autocephaly for “the Orthodox faithful of Ukraine” that these exarchs have been sent) is in the sphere of responsibility of the Moscow Patriarchate. Did the Ukrainian Orthodox Church ask for the autocephaly or was it the “Kievan Patriarchate,” which tries to separate itself? – The Ukrainian Orthodox Church did not ask for the autocephaly. Moreover, during the consultation of bishops recently held by the Ukrainian Orthodox Church, all the episcopate unanimously spoke out for the preservation of its current status. To help our viewers understand what autocephaly means I will explain that it is a Greek word translated as “self-heading.” It means complete ecclesiastical independence. –Why has the Patriarchate of Constantinople taken such step – practically creating a schism or supporting it? – For almost a hundred years the Patriarchate of Constantinople has been developing some kind of papistical doctrine, papistical self-identification. I would like to remind our viewers that historically the See of Rome was the first see in the Christian world, at least from the 4th century when the Roman Empire occupied the central place in the world. Yet, in the same 4th century Emperor Constantine moved the capital to the city of Constantinople which he had founded. At the Second Ecumenical Council a decision was taken that the See of Constantinople was to have equal privileges with the See of Rome. When in the 11th century the schism occurred between Rome and Constantinople, the Patriarchate of Constantinople, which had always been the second, took the first place in the family of the Orthodox Churches. 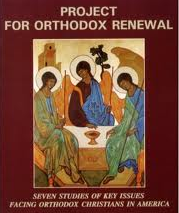 The Orthodox Church has never regarded this primacy as the primacy of power or jurisdiction. While in catholicism there is a notion that the whole Universal Church is led by the Pope who is seen as the source of authoritative powers for other bishops, the Orthodox Church has always had another system. This is the system of the Local Orthodox Churches. Each of them is independent, and none is subordinate to the other. However, in the 20th century (namely, in the 1920s) the Patriarchate of Constantinople that became the first due to a combination of circumstances began developing such understanding of its primacy that implied some special rights and privileges. When in the early 1960s the issue of convening a Pan-Orthodox Council arose, the Orthodox Churches agreed that the Patriarchate of Constantinople would be the moderator of this process not because Constantinople has any special privileges, as it claims now, but because such was the consensus of all Orthodox Churches. I believe that if the Patriarchate of Constantinople was really a force consolidating the Churches and helping them resolve their differences, then such institution would indeed be needed in the Orthodox Church. Regrettably, the Patriarchate of Constantinople acts quite differently, not being able to settle the conflicts arising between the Churches, for instance, between the Churches of Antioch and Jerusalem. 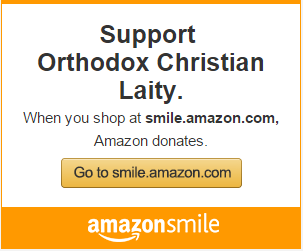 Instead of helping the Local Orthodox Churches overcome the schisms it itself begins to support the schisms. – As for the rights of the Patriarchate of Constantinople… For instance, Patriarch Bartholomew claims that the Patriarchate of Constantinople has exclusive rights to solve problems arising in the Orthodox world. In the light of what you have just said it seems that the Russian Orthodox Church does not agree with such position. Is that right? – We categorically disagree with such position. Here in my hands is the translation of Patriarch Bartholomew’s speech which he delivered several days ago before the entire episcopate of the Church of Constantinople. He said in that speech that the Ecumenical Patriarchate is the “President of the body of Orthodoxy,” that “the beginning of the Orthodox Church is the Ecumenical Patriarchate, that “Orthodoxy cannot exist without the Ecumenical Patriarchate.” How then did the Church exist until the 4th century, when there was no Ecumenical Patriarchate? And how did the Church exist when the Ecumenical Patriarchs fell into heresy? Sometimes we are accused that the Russian Church proclaimed its autocephaly on its own, because in the middle of the 15th century Metropolitan Jonah of Moscow was elected without the consent of the Patriarch of Constantinople. But how could Rus’ obtain his consent when the Patriarch of Constantinople was in the Unia, in the heresy? He sent us the metropolitan who commemorated the Pope and, after being banished, became a cardinal in the Roman Catholic Church. Thus, the claims of the Patriarchate of Constantinople not just on the primacy of honour, but on some special rights and privileges are not justified in any way. – Can in theory the Patriarchate of Constantinople issue a tomos of autocephaly? – Are there any precedents? – Yes, there are several Local Churches that received tomes from Constantinople. Yet, there other Churches that did not receive them. Such is, for example, the Russian Orthodox Church. It did not receive the tomos of autocephaly, but when the Patriarch was elected in Moscow, this act was confirmed not by the Patriarch of Constantinople alone, but by four Eastern Patriarchs: of Constantinople, Alexandria, Antioch and Jerusalem. In the person of those four Patriarchs it was a conciliar decision of the entire Church existing at the time. They accepted the fifth Patriarch into their family. It was the Patriarch of Moscow. – Today the official statement of the Synod of the Russian Orthodox Church has been made. Regarding the decision to send two exarchs to Kiev the statement reads, “These actions lead the relations between the Russian Church and the Church of Constantinople to a deadlock and create a real threat to the unity of the whole world Orthodoxy.” How will the Russian Orthodox Church communicate with the Patriarchate of Constantinople in future? Will it demand that the Patriarchate of Constantinople change its position? Is there such practice? – It seems that the means of church diplomacy have been exhausted by now. As, of course, you know, several days ago Patriarch Kirill visited Istanbul to meet with the Patriarch of Constantinople. I have to say that on the surface it was a civilized, polite and even brotherly meeting. However, regrettably, as the subsequent events showed, the Patriarchate of Constantinople did not only hear our arguments, but also acted, from our point of view, basely and treacherously. For they are sending their exarchs to Kiev not only without an agreement with the Moscow Patriarchate, but also without the consent of the Metropolitan of Kiev, whom, as Patriarch Bartholomew often said, he recognizes as the only canonical leader of Orthodoxy in Ukraine. We have made this statement today in the hope that they will reconsider their decision, that no exarchs will go to Kiev. However, in the event that the decision is not reconsidered, we will be forced to think of retaliatory measures. At the moment such measures are being discussed by our Holy Synod. – What retaliatory measures can there be in such situation? – There can be different measures. I will not speak of them before they are introduced, because at each stage we will give to those who are still our partners an opportunity to change their mind and reconsider their decisions. Why are we saying that these decisions lead the dialogue between our Churches to a deadlock and create a threat to the entire Orthodoxy? Because, firstly, there is in fact no dialogue going on at the moment – there is only a monologue of Constantinople that claims its exclusive rights and says that the See of the Metropolia of Kiev was moved to Moscow without the permission of Constantinople. It is being alleged that when in 1686 the Metropolia of Kiev became a part of the Moscow Patriarchate it happened on a temporary basis and that Constantinople has never ceased to regard Ukraine as its canonical territory. Then why have you kept silence for over three hundred years? Why did you not say anything? Why did you not say that this is your territory? Why have you just “remembered” that now? We categorically disagree with such false interpretation of the history: the letter that Patriarch Dionysios of Constantinople sent to Patriarch Joachim of Moscow in 1686 says nothing either about the temporary nature of the transfer of the Metropolia of Kiev to the Moscow Patriarchate or about some claims of Constantinople on this territory. Secondly, the current situation itself, when Constantinople in such an aggressive and cynical manner is interfering in the affairs of another Local Church, not only leads the dialogue into a deadlock, but also creates a threat of schism for the Universal Orthodoxy. In the event that Constantinople carries through its cunning plan of granting the autocephaly, it will mean that a group of schismatics will receive it. The canonical Church will not accept this autocephaly. The Russian Church will not recognize this autocephaly, of course. We will have no other choice but to break the communion with Constantinople. It means that the Patriarch of Constantinople will no longer have the right to call himself, as he is doing now, “the leader of the 300 million Orthodox Christians worldwide.” At least half of the Orthodox Christians will not recognize him at all. By his actions he will, in fact, split the world Orthodoxy. – Let us hope that it will not come to that. I have one more question. The events that you are talking about remind in some way the international developments of recent years. It looks like maidan, but within the Church: exarchs from the USA and Canada are going to Ukraine to negotiate the ecclesiastical independence, the schism is within the Church… What is the position of the Church regarding the foreign-policy challenges and regarding the fact that most of such actions have nothing to do with faith or care for the flock, but have more to do with politics? Do you agree with that? – Of course, all this is happening against the background of an acute political confrontation. More is to say, it is not fortuitous that the Patriarch of Constantinople is making such haste. He realizes that the days of the current Ukrainian authorities are numbered, that some other force will come, which will not endorse these papistical claims of Constantinople. That is why they are trying to do their dirty deed as soon as possible. It is interesting that the decisions concerning the autocephaly in Ukraine coincide with the decisions on granting the autocephaly to the so-called Macedonian Church. That is a direct conflict between Constantinople and the Serbian Church, and the Serbian Church participated in the Council in Crete, which we did not attend. However, the attitude towards us is the same. By the way, if the Council held in Crete is still described by Constantinople as pan-Orthodox, as the Holy and Great Council, whose decisions everybody should abide by, then why does not the Patriarchate of Constantinople itself abide by them? Recently they have adopted a sensational decision that a clergyman (priest of deacon) can be allowed to marry for the second time, if his wife abandoned him. It not only violates the canons of the Ecumenical Councils, but is in direct contradiction with the resolution of the Council in Crete that specifically states that priesthood constitutes an impediment to a new marriage. It is even difficult to imagine how they are going to wed such clergymen. For instance, will the priest be wearing a cassock with a cross at the wedding, or will he change into a suit? How will these priests be choosing wives – from among their parishioners? Such canons were not adopted by chance; it was done to protect the Church from a temptation. By acting on its own, without the consent of the Local Churches destroying the canonical order that was being established for centuries, the Patriarchate of Constantinople places itself outside of what we call the canonical field, that is outside of the legal framework of the Universal Orthodoxy. – Vladyka, to conclude our conversation I would like to specify once again: Constantinople has announced that it is sending its exarchs, the Moscow Patriarchate has responded today by the statement. We are waiting for next steps. It is not clear when these exarchs will go. Can there pass much time from the moment of announcement till the trip itself? Is there a chance that they will temporize? – I do not think that they will temporize. However, we, in our turn, should wait whether these exarchs will come or not, whether Constantinople will reconsider its decision or not. Therefore, as we have noted in our statement, we will, of course, take retaliatory measures. I believe that the time to take these steps will directly depend on the dynamics in the implementation of the project of “granting autocephaly,” in other words, of legitimizing the Ukrainian schism. That is what the Ecumenical Patriarchate is doing now, thus creating a real threat to the unity of Orthodoxy in the world.